Each morning perform three maximum effort sets of normal pushups. The pushup is one of the best, single exercises for strengthening the entire set of muscles that makes up the shoulder girdle. Major Armstrong described his morning routine in the following manner. “After rising, I would drop onto the deck and do my first set of pushups. I would then move into the head (bathroom) and start my morning toilet. I would return after a few minutes and do my second maximum effort set after which, I would go back into the head to shave. After shaving, I would return to the bedroom and complete the third and final set. Having completed all of the pushups, I was awake and ready for a relaxing shower. “ This routine should be followed during the entire training period. Since it takes most of us at least four weeks to reach our goals, you will probably find that you have inadvertently established a morning routine that is easy enough to keep as a lifetime habit, if not, you will at least appreciate the morning shower a little more. It has been noted that this pushup routine helps to alleviate any soreness during the first couple of weeks. It is recommended that you use the pushup routine everyday during this period so that you feel more comfortable during your initial adjustment to this regime of exercises. The following represents the heart of the training program. I recommend that you do not attempt the pull-ups until 3 or 4 hours after the pushup routine was completed. The program is conveniently divided into five training days. This is easily translated into a Monday through Friday approach to pull-up training. It is important to cease the pull-up routine for two days, Saturday and Sunday. 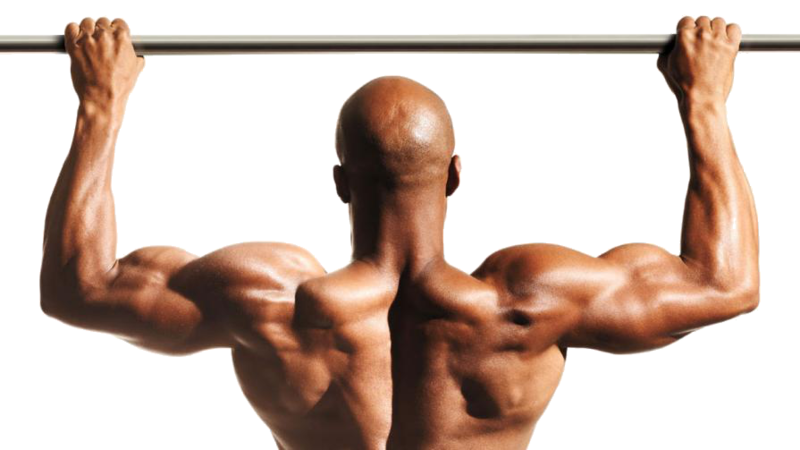 Further, it is necessary to use consecutive days (not to skip days) when on the pull-up routine. Finally, it is more important to do the pull-ups than it is to do the pushups. The training program was developed to improve performance in a specific exercise, the overhand pull-up. The program can be adapted to doing chin-ups and flexed arm hangs. The program depends upon quality exercises, numbers of repetitions are unimportant. When you are doing these routines you should concentrate on perfect execution of each repetition. The only person that you can fool is yourself. Five maximum effort sets. Rest 90 seconds between each set. Do not concern yourself with numbers. You will find that you will increase the numbers in the last two sets before you see much improvement in the first three. Make sure that each set is a maximum effort set. Pyramid Day. Start the pyramid with one repetition, the next set has two repetitions, the next has three. Continue in this fashion until you miss a set. (e.g. your last set was five, your next set would be six, but you could only do four. You missed a set) Do one more set at a maximum effort. Rest 10 seconds for each repetition in the previous set. Do three training sets with a normal overhand grip. Rest 60 seconds between each set. Do three training sets gripping the bar so that your palms are toward your face and your little fingers are touching each other. Rest 60 seconds between each set. Do the maximum number of training sets that you can accomplish. Rest 60 seconds between each set. You do training sets until you fail to do perfect training set. This day can wind up being the longest training day as you continue with the program because you will find it easy to do lots of training sets. Repeat the day that you found to be the hardest in the previous four days. This will change from week to week. Training Sets are easy to define, but require some experimentation to determine for the individual participating in the program. A training set a specified number of repetitions. That means one individual may have 3 repetitions in his training set, but another individual may have more or less. The key to determine the proper number of repetitions in a training set comes on Day 3. You must perform nine training sets that day. If you only do twelve repetitions in your best single set (a PFT set or a maximum effort set), then your training set would probably have one or at most two repetitions. If you were concerned with gross numbers performed, you might try for the higher numbered training set. This is not advised. It is much more important for you to successfully complete the scheduled workout on Day 3, doing one repetition per training set, than it is for you to complete only 6 or 7 sets, trying two or three repetitions in each training set. Day 3 calls for you to do six training sets. Adjust your training sets so that you can complete this routine properly. The best gauge for the number of repetitions in the training set comes on Day 4. If you successfully complete Day 3, try to raise the number of repetitions in your training set by one when you do Day 4. If you get a least nine sets done on Day 4, that tells you that your training set ought to be one repetition higher. If you get less than nine sets, you will still have accomplished a good day’s work, and confirmed that your training set was correct for this week. It is important that you do not change the repetitions in a training set in midstream. When you schedule yourself to the day’s routine using three repetitions in your training set, do not change it to two when the exercises get hard. Ladies will find that this program adapts well to the flexed arm hang. Training sets are simply translated into hang times. Chin-ups may be substituted for those who prefer this technique, however, day 3 must still be completed exactly as described with 6 sets done with the overhand grip. It is highly recommended that you follow this program using overhand grip as most of the obstacles that you will have to get over at OCS require an overhand grip. Once you have achieved your goal, you will remain at that plateau by doing at least 50 repetitions each day. Though this may sound like a large number of repetitions at this point in time, it is not, as you will happily discover during your time on the program. The program will work for anyone who will make a sincere attempt. You cannot expect any physical training program to work for you if you do not practice it regularly. In the first few weeks you may find that you are able to do fewer repetitions. This is a normal physiological reaction called teardown. As you continue, you will improve. If your performance is at the 12-15 repetition level when you begin this program, then it will take about 4 weeks to complete. If you are lower than that it will take longer. Have heart because if you continue with the program, you will reach the 20 repetition level. First of all, Thanks! I really need this, as a young man that does not want nothing more than becoming a marine first and then an officer. I have been practing on push ups and pull ups, but never like this. I will try my hardiest to complete and master this program. I have one question tho, what was the record that Major Armstrong set. Thanks again and thanks in advance!! Wow, Fred I looked through all the Google entries I could find with several specific searches and could not find Major Charles Lewis Armstrong’s actual record anywhere! I will ask a Marine Corps Historian and get back to you. What a mystery. This looks like it can help me go from 15 pull ups to 25 in no time! For the past few years, even after going months on end without any training, I’ve been able to do at least 14 good reps, but the 20 rep mark, even when I’ve been in great shape, has eluded me. I’m confident, though, that this program will get me up and over that hump. Before I started this program a week ago, I could do 17 good, overhand reps. When I get my first set of 20+ reps, I’ll repost. P.S. In the instructions on how to determine the reps per training set, the article references that you do at least 9 training sets on day three. But the day three instructions state that you do 6 training sets (3 normal, overhand grip, 2 close, underhand grip). Frankly I got to 20 pull ups only doing the 3 inboard 3 outboard sets that day, I never did the full 9 sets. So basically tailor it to whatever you’re feeling. I’d recommend sticking to 6, and increasing your reps per set until you get to double digits. Then, start adding weight. The Armstrong program is just a good base guideline and will be effective even if you change and personalize it quite a bit. It isn’t rocket science. Do a lot of pull ups often and you’ll be able to do more. KISS. Here’s my second post (as promised). I can finally do 20 good, solid, overhand reps! And this is despite putting on several pounds of fat over the past couple months! I followed this plan very closely and only missed a few days. Not only can I do 20 reps, but I’ve found that I now recover faster no matter how many I’ve done, which I think is this program’s greatest strength. The armstrong workout has helped me tremedously. when i first started i was only able to do 7 at most, now i’m doing 17 after about 2mths . i’m now shooting for 20-25 ….. I am trying this program however I am not sure if it will work for me. I am currently at 4 pull-ups. I have dropped 70+lbs and am trying my hardest to get in shape. I am not sure were to start. I have been using the assisted pull-up machine at my gym and in the last month went from 0 to 4. I spend around 3 hours a day at the gym, I would love to spend more but I have to work. My problem… Day 2 if I can only do 4 pull ups what should I do? it doesn’t seem like enough excise if I just do repetition of the pyramid up to 4 (assuming I get the full 4). Should I do this Armstrong Pull-up program with the assisted pull-up machine so that I can do slightly higher numbers? I have been doing 3 sets of 10 assisted pullups at 50lbs assistance. Would it be a good idea to give myself say 20lbs of assistance so maybe I can do say a few more of each set? It just seems like my numbers are too low for the program. I will do anything to get this done! Also, can I continue doing my other excises like weight lifting, and assisted pull-up machine? 1. In my opinion, if you can’t do 6-8 pull ups per set, you should assist the MINIMUM amount required to get to about 7 pull ups per set. Just find the right weight. Get pissed and embarrassed every time you use assist–you want to be motivated to wean yourself off that as fast as possible. 2. Spending 3 hours at the gym? That makes me think you’re wasting alot of time, or possibly overtraining. At OCS you don’t even work out 3 hours a day. Try doing my workout, or using it as a starting point. Workouts should be intense, under one hour, and hit your cardio and resistance training hard. You don’t need 3 hours. 3. If you really can’t design your own workout, follow mine, or discipline yourself, do P90X. That’s the workout I did personally before OCS and it was excellent. It is aimed at burning calories, as well, which sounds like your problem. 4. Huge congratulations on losing 70+ pounds. Keep up the good work! 5. Let your biceps and upper back rest after Armstrong–it is a tough enough workout that those muscles get hit as hard as they need with just Armstrong. Don’t overtrain. He passed away this year from brain cancer. Look it up again. Impressive achievements. That’s not how I did it, and I got 20 pull ups, but I added that in as an option. Thanks! Which grip is used for the PFT? Palms facing out or in? I really wan’t to join the Marine Corps when i graduate. I’m almost a sophmore in high school, I have a small build, about 5:8, and 130 pounds. I can only do 3 pull ups and have been on this program for a week. I hope to reach at least 10 perfect pull ups before boot camp. Does this program help me to achieve the one arm pull up? I’m kinda good at differenet variations of pull ups, so I want to do the one arm pull up, and if I won’t be able to do a rep at the end of my program, then I guess, I will try this. And if I try this, i’ll have to do one-arm pushups in the morning routine? Pingback: ROTC Concentrated Training Routine | Jasper Burns | Within this site, lives me. I’ve got a question on combining Armstrong program with other workouts. It’s clear for me that I shouldn’t do any other exercises for bicep and upper back but considering morning push-ups routine what about more tricep and chest training. And one more question. Can I do routine for other body parts right after Armstrong sets or should I do it earlier or later. Yes, definitely feel free to add more tricep and chest pushing exercises. It would be beneficial to do Armstrong first, then other workouts anytime after. This is no good as it is missing crucial bits! like day 3 has 3 sets of 3 different type…chin up w hands todather, normal pull up and then wide. Can you update it please as I can not find a proper version. Had a question, do not see how Day 3 became nine sets, it has three and three. >Do three training sets with a normal overhand grip. Rest 60 seconds between each set. Do three training sets gripping the bar so that your palms are toward your face and your little fingers are touching each other. Rest 60 seconds between each set. Corrected. Thank you, AC. Originally it was nine sets, but we modified the workout to avoid overtraining.